The Wedding at Canaa, 93 x 72 cm, Copy 1561, (original 1476), Museum Boymans and van Beuningen, Rotterdam. This painting has been neglected by the professionals, because it is highly obscure, and we own only two copies painted after Bosch's death (1516). Wilhelm Fraenger gave an interpretation. It supported his speculations on Jacob van Almaengien. Without question it shows a wedding attended by Jews and Gentiles. 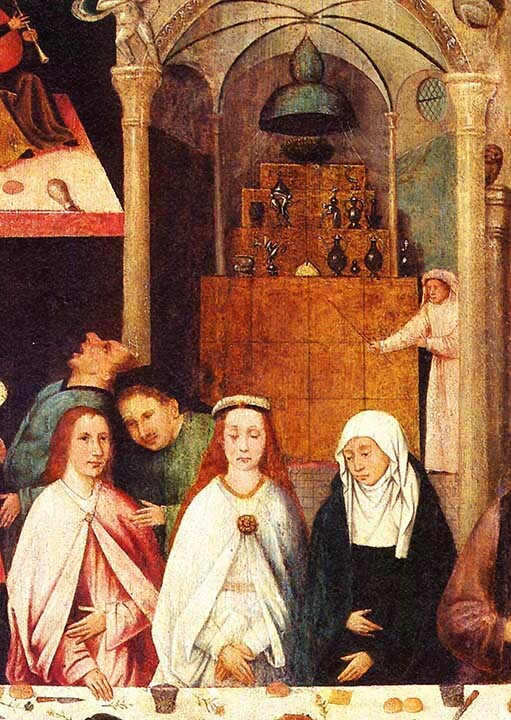 Most people agree to the similarities of the groom with Jacob in other Bosch paintings. It shows the wedding of Sibylle and Jacob at her father's house in Vught. I discuss its various peculiarities in the novel. In my reading Sibylle's father is the man in the green coat. The woman next to her, her grandmother. 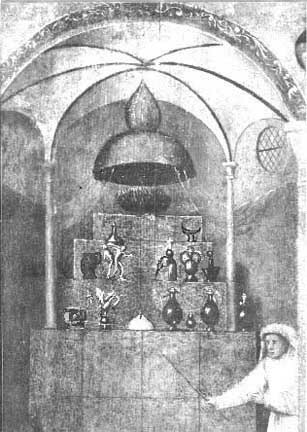 Prominently behind the bride and her grandmother Bosch painted an enigma, an altar filled with obscure objects, which Fraenger interpreted as a fertility shrine, decidedly not of Jewish origins. I give an explanation of its origins in the novel. More important to my reading of Jacob's background are the two people who sit next to Christ who have not been identified before (see below). 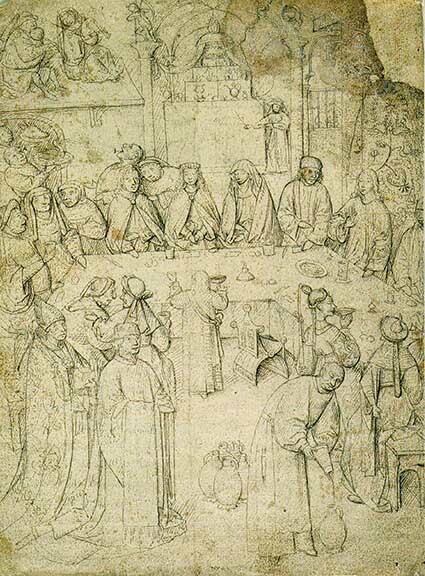 The Wedding at Canaa, drawing after Bosch's original (digitally enhanced), 28.1 x 20.8 cm, 16th century, Louvre, Paris. 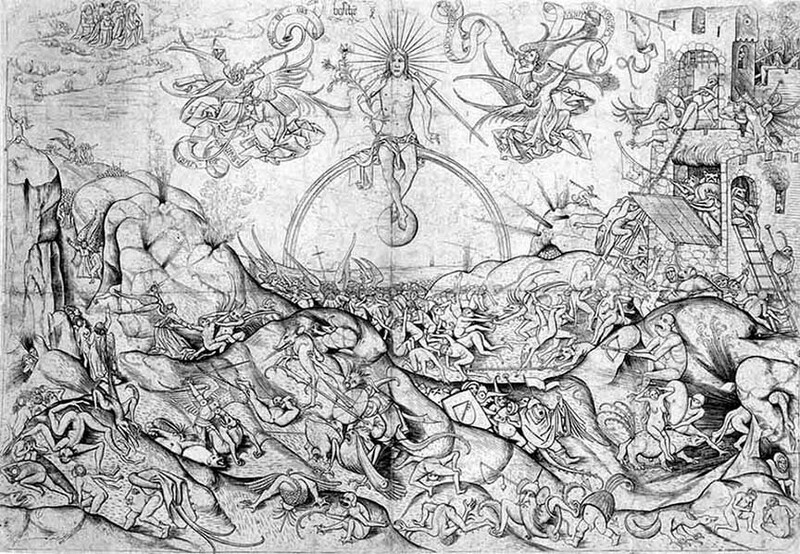 This drawing shows the Bosch original before a substantial overpainting of the painting. Apparently two clerics occupied the left foreground. It is highly unlikely that the two churchmen, who are obviously fleeing the strange wedding party are donors. I suggest they are Bosch's sarcastic caricatures of the deacon of Sint Jans Church in Hertogenbosch and his bishop. They were later replaced by two dogs sniffing for the holy traces of the ecclesiastical dignitaries. In addition a second musician has been overpainted, otherwise drawing and painting are in close agreement. In front of a precious, golden wall-hanging sit Christ and two hitherto unidentified guests. The left in the robes of a canon, the other in those of a medieval scholar. The wall-hanging and the presence of Christ bestow an aura of honorable virtuality on them. A search for their identity has produced a rather logical surprise. 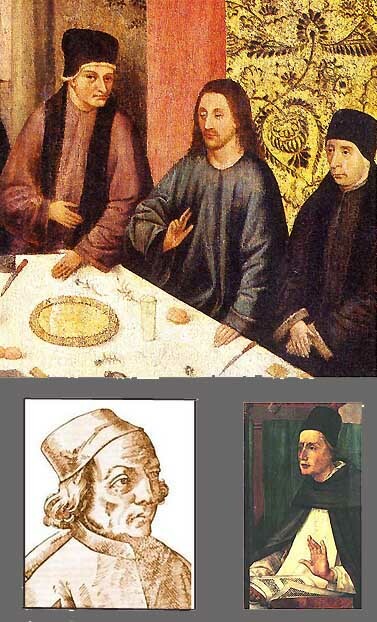 As the two attached portraits show, the left is Marsilio Ficino, Jacob's teacher and mentor, and the other Albertus Magnus, the famous 13th-century teacher of Augustinus! Ficino's identity is good, Albertus' somewhat more tenuous. This discovery lends unexpected support to the credentials I heaped on Jacob van Almaengien and to my Neoplatonic reading of the Garden Triptych. The purported role of Augustinus in Jacob's teachings is described in the novel.. This enlargement shows the couple, Sibylle's grandmother and the enigmatic initiation altar. It is not necessary to repeat the detailed description of the objects on the altar given in the novel. That it plays an important role in this painting is obvious. However, despite Fraenger's erudite arguments it will always remain a puzzle. St. Hieronymus in Prayer, 77 x 59 cm, 1482, Musee des Beaux-Arts, Ghent. St. Hieronymus, Bosch's patron saint, in fervent prayer, suggests that Bosch painted this single panel on occasion of his father Anthonius' death in 1482. 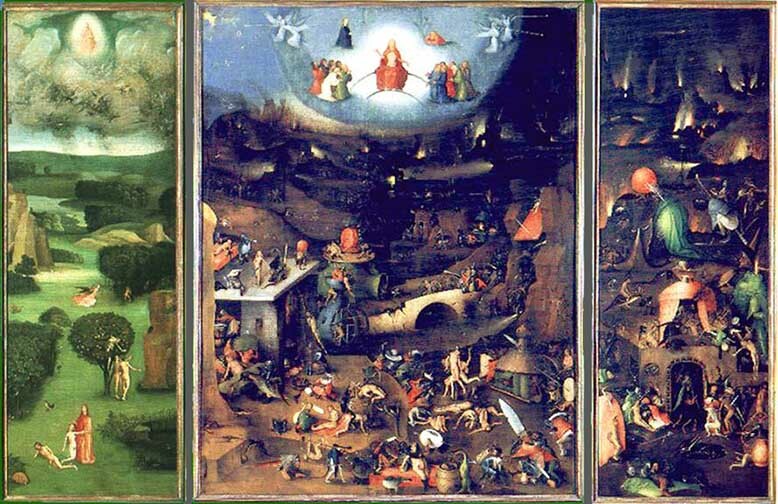 This is the only middle panel of several "Last Judgment" triptychs painted by Bosch which has come down to us. By comparison with the middle panel of the Garden its layout and execution is sufficiently arbitrary and routine to suggest that it too was painted by the shop, perhaps on the basis of a sketchy underdrawing by Bosch himself. 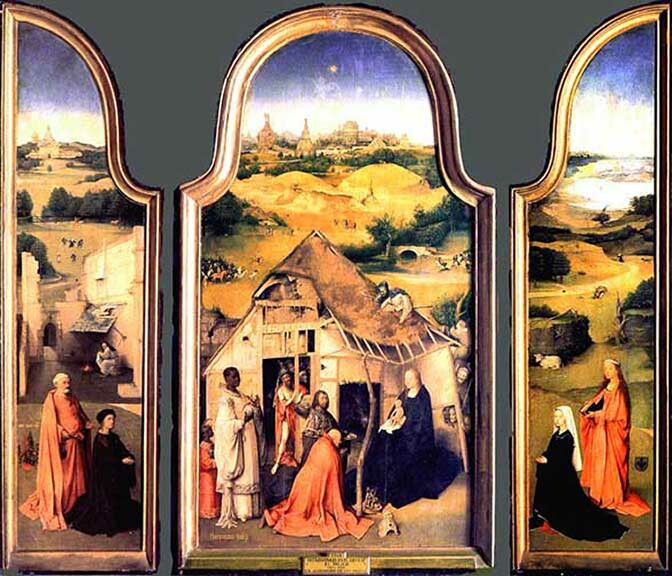 Adoration of the "Four" Magi (Bronchorst and van Boschuyse Triptych), 72 x 138 cm, (wood undated), 1484(? ), Prado, Madrid. This triptych occupies a special place in Bosch's oeuvre. Jacob van Almaengien does not appear in person and seems not to have had a direct hand in its conception and execution. 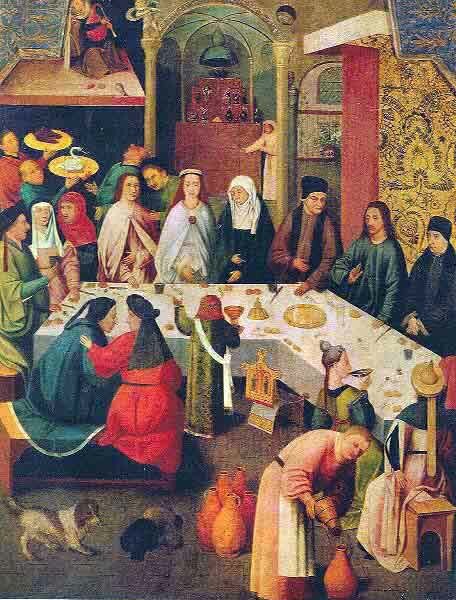 It is Bosch's first major commission executed by himself, and it is the first painting which Bosch signed jheronymus bosch in the left lower corner of the middle panel. The well-integrated wings show the client and his wife with their patron saints. They are otherwise of minor importance. 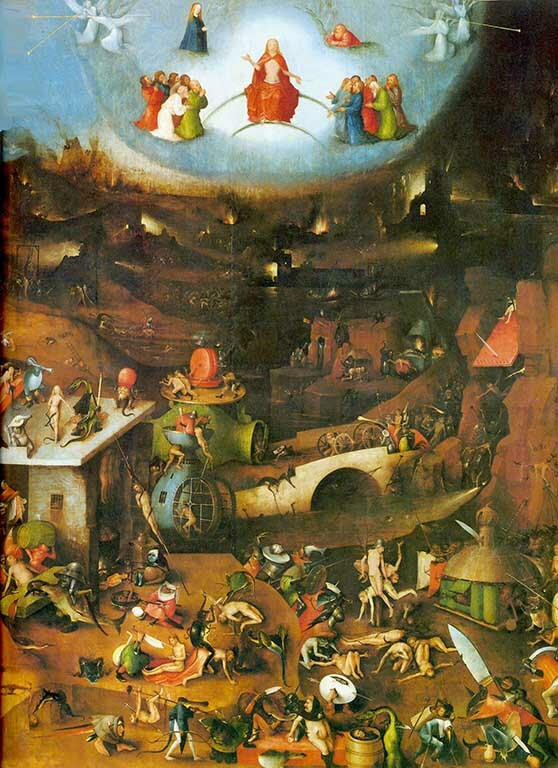 The middle panel is, however, as startling and unorthodox as only Bosch's signature paintings can be. This Adoration of the Magi is unique in the arts before and after Bosch. It illustrates the apocryphal, non-biblical, Hebrew stories connected with the visit of the Three Magi to Bethlehem which are much more colorful than we are normally aware of. They go back to Adam: Adam had saved three Precious Things from Paradise: Gold, Incense, and Myrrh, the symbols of his Kingship, his position as High Priest, and of his magical powers of Healing. Noah's sons saved not only Adam's body but also these three Precious Things. After the Flood they buried Adam's remains on the Hill of Golgatha. The Three Precious Things were brought to Bethlehem by the Magi to anoint the new-born Christ as the King, Priest, and Healer of the New Covenant, as the "New Adam." Christ would, of course, be crucified at Golgatha. Older and Eastern-Orthodox depictions of the Crucifixion still show Adam's scull and bones under the Cross. 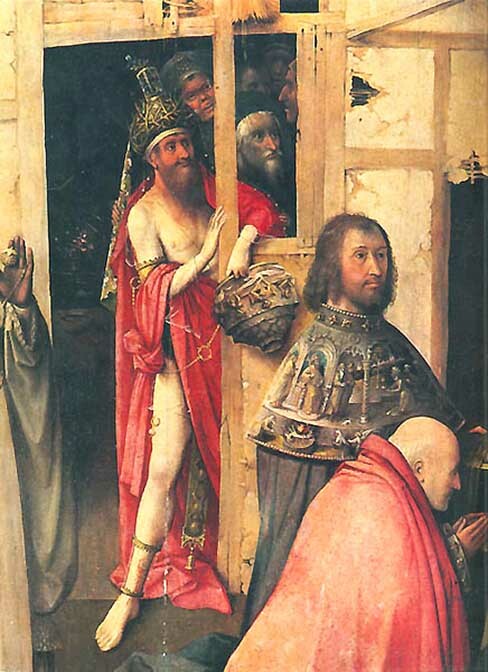 This is the reason for the appearance of Adam in the stable door of Bosch's Adoration of the Magi. Jacob had translated the apocryphal accounts from various Hebrew texts. At Bosch's time various parts of this story had been recovered, and a heretical Adamite Sect flourished near Brussels. A possible reason for the Bronchorst commission. Adoration of the "Four" Magi, Middle Panel, Adam in the Door of the Stable, 1484(?). Hung with a profusion of prophetic ornaments, Adam is the main personage in this painting. A great smile on his face he watches the inauguration of the New Adam. Following Fraenger, I describe the meanings of the ornaments Adam wears and those of the three Magi in detail in the novel. This panel is unique among Bosch's paintings for its tight composition, its large-surface psychological portraits, and the carefully handled brush. Its saturated colors are unusual for Bosch, who crowds his paintings with small details and paints fast with thinned pigments. Was it painted by Bosch? 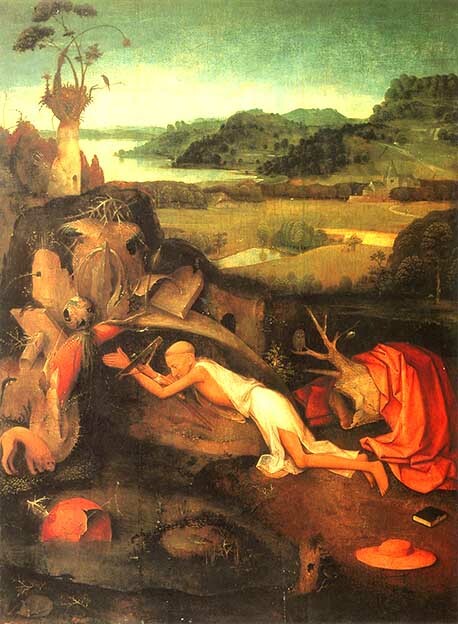 It is attributed to him by all Bosch experts. 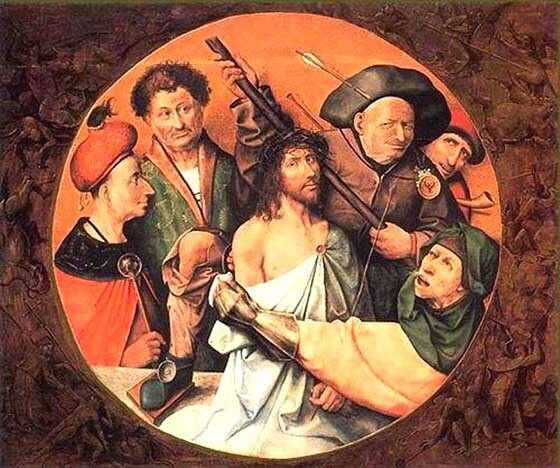 I am not equipped to judge, but suggest that it may be a copy after, for example, an early Roger van der Weyden from the time (~1440) of Weyden's Descent from the Cross (originally in Leuven, now Prado, Madrid). Christ Crowned and Mocked, 165 x 195 cm, 1530, Escorial. This large tondo had been attributed to Bosch by all art experts. Dendrochronology has now shown that it was painted around 1530, long after Bosch's death. 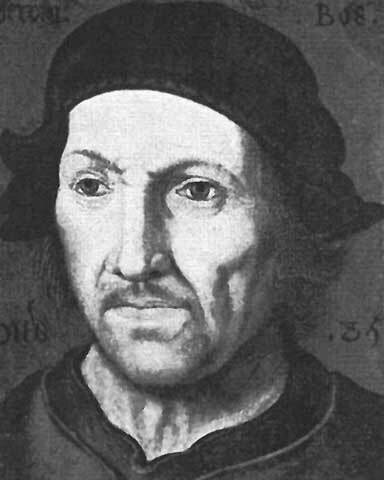 It is now being attributed to Quentin Masseys, who, alas, died in 1533. I include it here, because the man in the green morning robe is in all probability Bosch at the age of ~50, at the height of his career. The former attribution of this tondo to Bosch is difficult to comprehend. Bosch never included himself in any of his paintings, except in the dark background of the Garden cave. I have a heretic suggestion, is this painting a sarcastic take-off on the rich, famous and by that time notorious burgher Hieronymus van Aken, dit. Bosch? The panel is not signed! Bosch's fame and notoriety was spreading rapidly after 1504! Wings of a Last Judgment, each panel 87 x 30 cm, 1491, Palazzo Ducale, Venice. 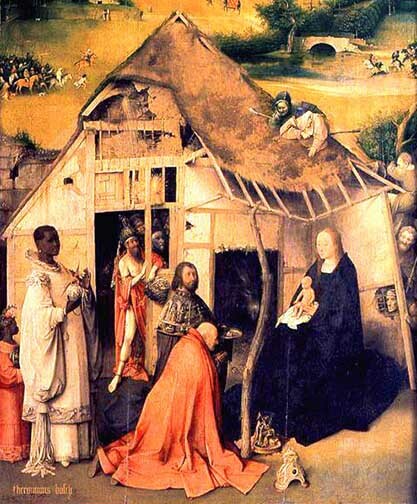 This fairly small triptych (87 x 180 cm opened, assuming that the lost middle panel measured 87 x 60 cm) is the only authentic example of Bosch's ideas about the Second Coming of Christ. 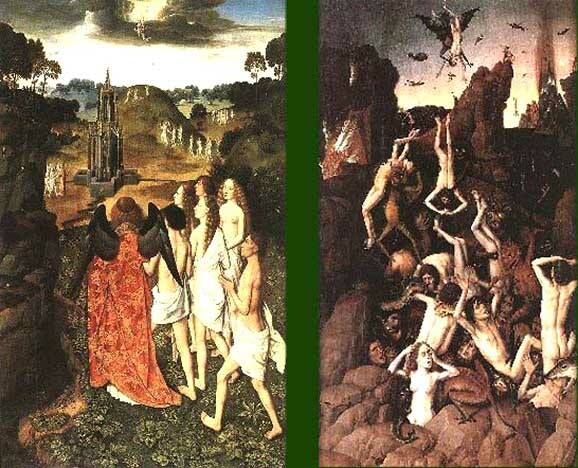 The Fall into Hell (left two wings in my arrangement of the four panels), reminds one of Hans Memling's Last Judgment in Gdansk (~1470), but also of Dieric Bouts the Elder's Two Wings of a Last Judgment in Lille (~1450). I consider it unlikely that Bosch's middle panel showed the conventional Angel of Judgment weighing the resurrected as Memling's does. The Bouts is much closer to Bosch's vision of the Path to the Hereafter. Like the Angel of Death in Bouts' triptych, Jacob, from a mini-Garden, is showing the electi the Fountain of Life. Unfortunately the middle panel of the Bouts triptych is also lost. 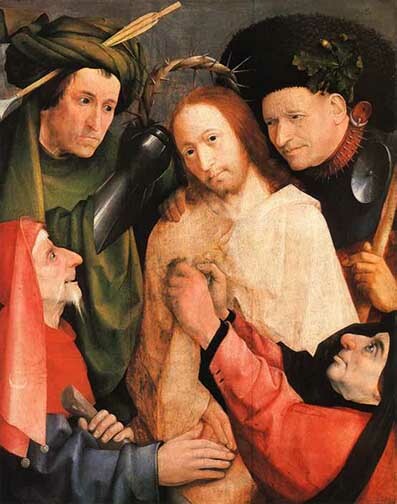 Were both, Bosch's and Bouts' depiction of Christ's Second Coming too heretic for their contemporaries? Wings of a Last Judgment, The Flight through the Tunnel, 87 x 30 cm, 1482, Palazzo Ducale, Venice. However, Bosch's vision of a Tunnel to the Hereafter is unique. It has no parallel in the visual arts until the end of the 20th century! This Judgment by Bouts the Elder (1415-75) is, to my knowledge, the only other example of an ascent to heaven without the intercession of the Church besides Bosch's Last Judgment above. The angel of death shows the resurrected the Fountain of Life and the path to heaven. In addition insects and other creatures a seen flying in the sky above the Fall to Hell. Both examples show that typically "Boschian" ideas were extant in Brabant before Bosch's time. Allart Duhameel, Second Coming of Christ, engraving, 1479-1509, Rijksmuseum, Amsterdam. Two other examples of "Boschian ideas" are posed by two engravings by Allart Duhameel. Duhameel (1449-1507) was the chief architect of Sint Jans Church in s'Hertogenbosch and one of the first master engravers in Brabant. He certainly knew Bosch, and it is generally assumed that this engraving (and an horizontally flipped(! ), almost identical companion of 1520-30) are copies after a Bosch painting. The very close similarity of the two prints shows that they could have shared a common original. Both engravings certainly use a number of specific "Boschian" motives. More important for the present discussion, they show the chosen guided by armored angels walking on foot to their fly-off point on top of the mountain at the left. The Church is not involved. For me this is the significant aspect of the engraving: Duhameel also knew of this heretic view! As a daring experiment I flipped the Duhamel engraving (notice that Christ is now holding the sword in his right hand!) and collaged it with the four Venice fragments into a single large polyptych. This shows that such a polyptych is technically possible. Of course, this can be no more than an aid to one's imagination. It posits no claim for such a painting to have existed. Anonymous painter, Hieronymus Bosch at 35 (dated 1485), 15 x 12.5 cm, Amherst College, Amherst, Massachusetts. This unique portrait of Bosch was exhibited in Rotterdam in 2000. So far, I could not obtain further details or the provenance of this painting.